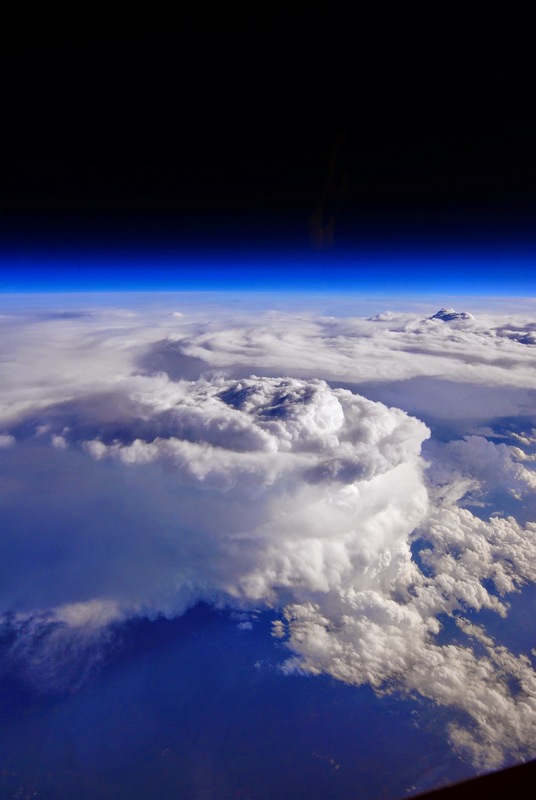 This storm cell photo was taken from NASA's high-altitude ER-2 aircraft on May 23, 2014, during a study aimed at gaining a better understanding of precipitation over mountainous terrain. The Integrated Precipitation and Hydrology Experiment, or IPHEx, field campaign is part of the ground validation effort for the Global Precipitation Measurement (GPM) mission, an international satellite mission led by NASA and the Japan Aerospace Exploration Agency. GPM's Core Observatory launched Feb. 27, 2014, to provide next-generation observations of rain and snow worldwide every three hours. But to get accurate measurements from space, scientists have to understand what is happening on the ground. For the six-week IPHEx field campaign over the southern Appalachian mountains, the NASA team and their partners at Duke University and NOAA's Hydrometeorological Test Bed set up ground stations with rain gauges and ground radar throughout western North Carolina. In addition to the ground sites, they also collected data sets from satellites and two aircraft. The NASA ER-2 aircraft that deployed to Robins Air Force Base in Warner Robins, Georgia, was able to fly when rain was in the air. The ER-2's cruising altitude of 65,000 feet kept it well above the storm systems it was observing, allowing it to act as a proxy-satellite. The aircraft carried a suite of instruments, including three that took measurements similar to those taken by GPM's Core Observatory. The second aircraft participating in the research was the University of North Dakota's Citation. The Citation flew at altitudes between 10,000 and 25,000 feet and measured raindrops and where ice particles formed. The ER-2 joined the Citation on several occasions, flying above the other aircraft to get the full profile of rainfall in the atmosphere. When it returned to the NASA Armstrong Flight Research facility in Palmdale, California, the ER-2 had flown 18 IPHEx science missions totaling more than 95 flight hours over the southeastern United States, including North and South Carolina, Florida, Georgia and Tennessee. NASA and its partners monitor Earth's vital signs from land, air and space with a fleet of satellites and ambitious airborne and ground-based observation campaigns. The agency shares this unique knowledge with the global community and works with institutions in the United States and around the world that contribute to understanding and protecting our home planet.